On Saturday, October 29, the Most Reverend Alexander K. Sample, Archbishop of Portland, Oregon, will celebrate the Pontifical High Mass in St. Peter’s Basilica for the Populus Summorum Pontificum international pilgrimage, with His Eminence William Cardinal Levada, Prefect Emeritus of the Doctrine of the Faith and former Archbishop of Portland, giving the homily. After the Mass, members of the clergy are cordially invited to gather for a standing lunch at the Palazzo Cesi (via della Conciliazione, 55) with the celebrants and Archbishop Guido Pozzo, Secretary of the Pontifical Commission Ecclesia Dei. 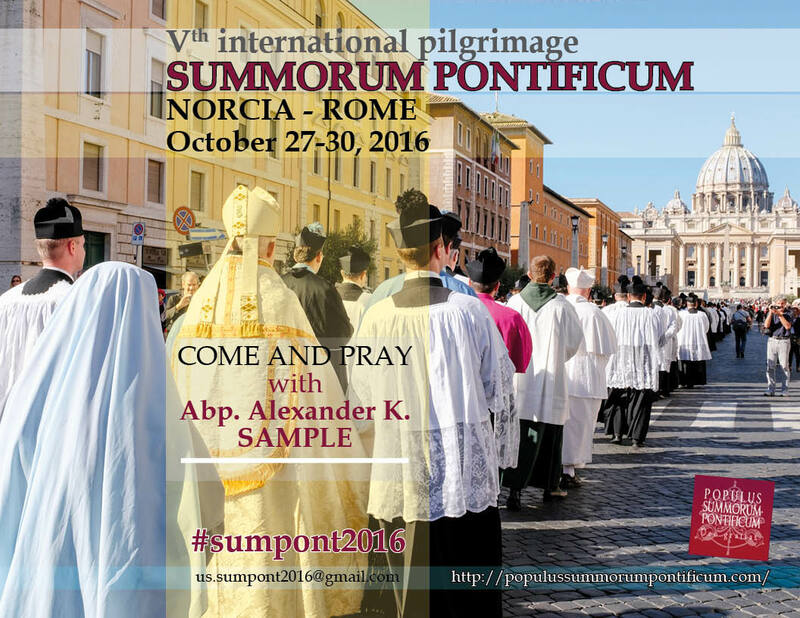 All priests, religious and seminarians are welcome, but are asked to sign up by October 15, in order to help the organizers prepare for the event.